Ottawa-based Corel Corp. announced on Thursday that it has acquired Parallels, a software vendor best-known for the desktop virtualization software that allows Windows to run on Mac OS computers. Financial details of the deal were not disclosed in a press release. Corel says that it plans “significant investment into the Parallels business” and sees a chance to grow the combined business through the two firms’ customer bases and partner networks. It’s the third acquisition that Corel CEO Patrick Nichols has made this year and he says more are on the way. He says Corel, a private company, has been profitable over the years. Parallels was a good target because it has a similar go-to-market strategy, Nichols says, one that involves both direct online sales and two-tier distribution with various resellers around the world. On the same call, Parallels CEO Jack Zubarev says his private firm, which began with venture capital investments in 2001, was at the point of maturity that shareholders asked him to evaluate options for a buyer. Corel was the best option. “Given the scale, the synergies, the technology leverage that our customers will see in our road map, it makes sense,” he says. Parallels will operate as an independent unit within Corel for at least a year, Nichols says, as the firms get to know one another. From there, overaps in the backend systems and in the sales and marketing operations will be identified. It will be business as usual for channel partners of both firms, at least to start with. Nichols says the firms’ overlap in sales strategies meant partners were already talking to the same people. Eventually, Corel will find ways to combine the organizations. Corel and Parallels have collaborated previously on software bundles. Readers of the Parallels blog got a hint of the acquisition Dec. 18 when the content feature was “How to Run CorelDRAW on Mac with Parallels Desktop.” Though the post didn’t actually indicate an acquisition was about to take place. Projections of the desktop virtualization market paint a picture of rapid growth in the years ahead. According to Orbis Research, the market was valued at almost $5 billion in 2017 and is projected to reach a value of nearly $9 billion by 2023, growing by 10.3 per cent annually. Behind the trend is the tendency to allow employees to procure and use devices of their own choice at works, meaning the IT department has to provide a secure virtual desktop to the user. Healthcare is one of the fastest-growing verticals to adopt desktop virtualization. Both Orbis Reseach and IDC rank Parallels as a major player in the desktop virtualization market. It competes with Citrix Systems, VMWare, Microsoft, and Huawei in this space. Parallels software is offered up at Apple and Microsoft stores as a virtualization solution for consumers that want Mac hardware and Windows software. It’s also a popular solution for the IT department. 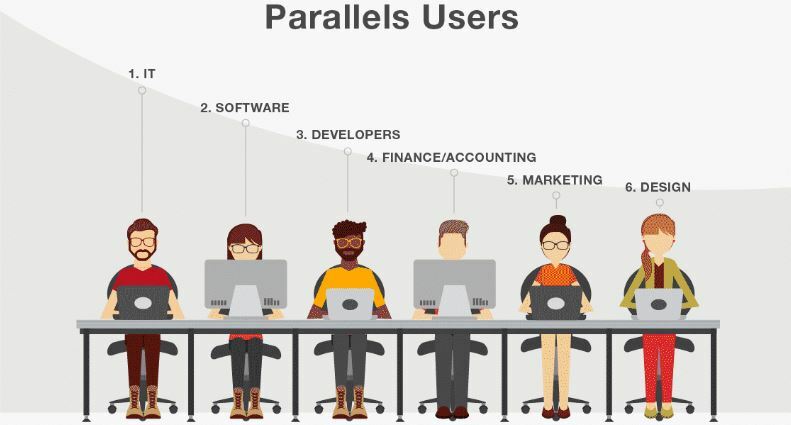 A May, 2017 infographic reflecting user data on the Parallels blog identifies IT users as its top segment, followed by software, developers, finance, marketing, and design. Corel’s existing software portfolio consists of CorelDraw, WinZip, ClearSlide, and MindManager. Corel was founded by Michael Cowpland in 1985 and was well known for its word processing and graphics design software, achieving high sales in the late ’90s and early 2000s, at one time claiming the title of the largest software firm in Canada. Nichols took the helm at Corel in 2015. Other notable recent acquisitions he’s made include Mindjet MindManager in August 2016 and Gravit GmbH in June 2018.